The futuristic McLaren with self-healing tyres. 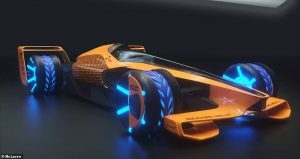 McLaren Applied Technologies (MAT), the sister company of the Formula One team, has unveiled a futuristic concept car that we probably wont see on the track until 2050. That is quite some time to wait for the all-electric vehicle currently named the 2050: MCLExtreme. The McLaren team collected opinions from its F1 fans in order to come up with ideas for the model “which features an on-board artificial intelligence co-pilot, an electric battery that can be folded away and self-healing tyres,” says the Mail Online. MAT hasn’t just thought about producing a futuristic car, its team has also given a great deal of thought to the way human driver performance may develop, what racing tracks might look like in 2050 and how the Formula 1 experience might have changed for fans of the sport. The MCLExtreme is a 500km/h rear-wheel-drive electric car powered by a “foldable battery moulded to the aerodynamic package,” McLaren announced. Futuristic designs like this are nothing new for the firm, which has been working on way out ideas since 2015 when it released images and designs for its MP4-X. It also appears that Formula One fans are not in favour of flying cars and race tracks in the air, and this has influenced McLaren’s approach. Try out an existing McLaren model. Titanium Luxury Hire can deliver your McLaren to your hotel, home or airport. Contact us now to rent a McLaren.